Forward Isaiah Nordeng drives past defender. 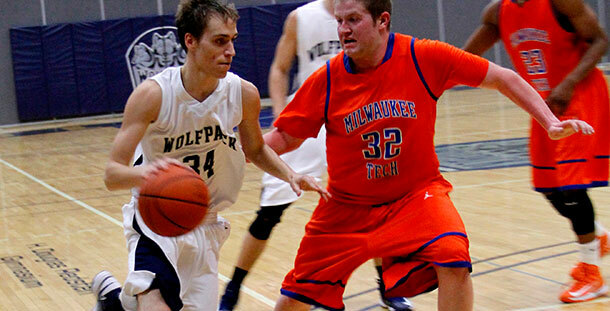 A challenging season for the Madison College men’s basketball team continued into the New Year. The team only won one game before the holiday break began, and has only won once since that time. The WolfPack, which has lost six of its last seven games, posted its second win of the season on Jan. 7, a 80-72 victory over UW-Marathon County. Each of the team’s last three games have been double-digit losses. Madison College has 12 games remaining on its regular-season schedule, including a game at Rock Valley College on Jan. 23. The next home game is at 3 p.m. on Jan. 26 against College of DuPage. The Madison College men’s basketball team earned its first home victory of the season on Jan. 7, with an 80-72 win over UW-Marathon County. The WolfPack had arguably their best first-half offensive performance of the season, scoring 45 points before halftime. Adam Ruka and Charlie Grafft led a Madison charge, that erased an early three-point deficit, into a double-digit lead. Ruka gave the WolfPack their first lead of the game (4-3), just over a minute into the first half. By the halfway point of the half, they were up by 15 points. Each scored multiple points in a three-minute stretch, when Madison College extended its lead from six, to 16. Marathon was able to close the gap before halftime, after trailing by as many as 18 in the first half. The WolfPack scored just two baskets in the first six minutes of the second half and their once 18-point lead, was down to four. Dominic Fumbanks helped Madison regain control, scoring five straight points and giving Madison an eight-point lead. Shortly after, he sank another 3-pointer and gave Madison another double-digit lead, at 10. Jason Miller helped maintain that lead and finished with a team-high 17 points. Ruka finished with 16, Isaiah Nordeng had 15 and Fumbanks had 14. They boosted Madison to a significant advantage in shooting percentage. The WolfPack converted on over 56 percent of their shots, while Marathon just topped 40 percent. scontrol offense kept Madison College from mounting any second-half rally. Madison College committed 18 turnovers in the game, while Joliet had just five. Miller and Ruka led the WolfPack in scoring, with both players netting 12 points. Jason Miller scored 22 points and Adam Ruka added 14, but the WolfPack was unable to overcome Milwaukee’s balanced attack and fell, 69-52, on Jan. 16 Milwaukee had four players score in double figures and led throughout much of the game.